Imran Awan, the House Democrat’s information technology staffer who was busted for unauthorized access to government computers has been apprehended at Dulles Airport trying to flee to his native Pakistan. 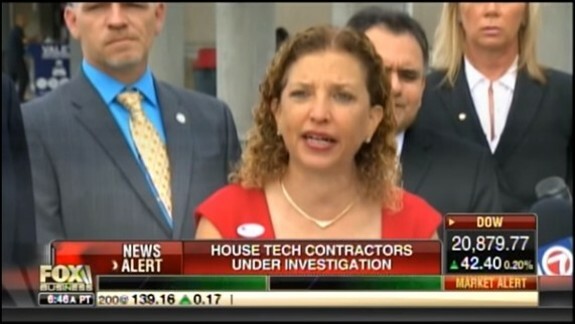 Just yesterday we learned that FBI agents seized smashed computer hard drives from the home of Florida Democratic Rep. Debbie Wasserman Schultz’s information technology (IT) administrator, according to an individual who was interviewed by Bureau investigators in the case and a high level congressional source told our friends at Zero Hedge. The congressional source, speaking on condition of anonymity because of the sensitivity of the probe, confirmed that the FBI has joined what Politico previously described as a Capitol Police criminal probe into “serious, potentially illegal, violations on the House IT network” by Imran and four of his relatives, who had access to the emails and files of the more than two dozen House Democrats who employed them on a part-time basis. Capitol Police have also seized computer equipment tied to Wasserman - Schultz. Awan, who is rumored to have ties to Pakistan’s ISI intelligence agency is the head of a gang of Pakistanis that included his brothers Abid and Jamal Awan, who were barred from computer networks at the House of Representatives The Daily Caller News Foundation Investigative Group reported on Tuesday, February 7, 2016. The brothers, and their wives Hina R. Alvi (Imran Awan’s wife) and Natalia Sova are suspected of serious violations, including accessing members’ computer networks without their knowledge and stealing equipment from Congress reported our friend Luke Rosiak of the Daily Caller. Alvi is a female House IT employee who works for many of the same members as the three brothers, as well as the House Democratic Caucus. Inexplicably, or perhaps not, Awan has been kept on the payroll of Wasserman-Schultz despite the rapidly escalating scandal that potentially involves multiple federal crimes. The five Muslim employees worked for at least three members of the House Permanent Select Committee on Intelligence and five members of the House Committee on Foreign Affairs were among the dozens of members who employed the suspects on a shared basis. The two committees deal with many of the nation’s most sensitive issues, information and documents, including those related to the war with radical Islamic terrorism. Luke Rosiak reports that despite the generous salaries, the four were involved in multiple suspicious mortgage transfers and a debt-evading bankruptcy. Abid Awan had more than $1 million in debts following a failed business and court documents filed claiming that Abid had stolen money and vehicles from associates in that business. Rosiak has reported that while working for Congress, the Pakistani brothers controlled a limited liability corporation called Cars International A (CIA), a car dealership with odd finances, which took–and did not repay–a $100,000 loan from one Dr. Ali Al-Attar. Laundering money through used car dealerships is a known Hezbollah tactic. In 2011 the government filed the civil asset forfeiture action in New York against 30 car dealerships from Michigan to Florida. The vehicles were then moved to West Africa and resold, and cash from the sales was mixed with profits from illegal drug distribution and funneled back to Lebanon to fund terrorist activities. The government, which was trying to seize $400 million in assets in the case, lists Hezbollah as the most technically capable terrorist group in the world, with strong ties in Syria and Iran. Philip Giraldi, a former Central Intelligence Agency officer, wrote that Dr. Ali Al-Attar “was observed in Beirut, Lebanon conversing with a Hezbollah official” in 2012–shortly after the loan was made. And scamming the gullible George W. Bush administration into doing what it really wanted to do in Iraq wasn’t Dr. Ali Al-Attar’s only con. Rosiak reports that in 2009, his medical license was suspended by Maryland for separate instances of billing patients and insurance companies for unneeded services. Attar was indicted in March 2012 on separate tax fraud charges after the IRS and FBI found he used multiple bank accounts to hide income. He fled back to Iraq to avoid prison reports Luke Rosiak. According to Zero Hedge, the Awan brothers worked for more than 30 House and Senate Democrats, as well as Rep. Debbie Wasserman-Schultz. The substantial scandal has raised questions about who may have been passed data which the Awans had access to, given Pakistan's history of collaborating with a number of foreign countries that have demonstrated past willingness to influence U.S. politics. The brothers were also employed by members of the House Permanent Select Committee on Intelligence and the House Committee on Foreign Affairs, such as: Jackie Speier (D-CA), Andre Carson (D-IN), Joaquín Castro (D-TX), Lois Frankel (D-FL), Robin Kelly (D-IL), and Ted Lieu (D-CA). Lieu has since openly called for leaks by members of President Trump's administration despite the fact that he may until recently have been under surveillance by a foreign entity note our friends at Zero Hedge. Why has none of this made the front page of The Washington Post, New York Times or the lead segment of the ABC, CBS, NBC or CNN evening news?